We are at the end of the first week of this Mega Marathon and today’s alphabet is ‘G’. I had quite a few choices for this alphabet but I wanted to cover as many states of India as possible and so I picked this Maharashtrian dish. There was also Ghavan from Maharashtra but I thought it would be good to give the rice family a break and go with wheat. Also, I recently got a free packet of 5kg of wheat flour from my online vendor and so I need more ways to use it up. Of course, there is going to be more wheat bread but I thought I would try some dosas with it too. This Gavhache Dhirde is quite similar to the Tamizh ‘Karacha Maav Dosai’ but it uses only wheat flour as against a mix of wheat and rice flour in the latter. Also, there are quite a few vegetables added which makes it a soft, healthier and less crispy version of Karacha Maav Dosai. Gavhache dhirde looks prefect for quick dinner, adding vegetables to this wheat flour batter makes this instant version dosa looks inviting. This is similar to Sindhi Chilro except that this is a healthier version with veggies in it , and from now on this would be my go to recipe . Dhirde looks awesome and I actually don’t mind it for my lunch ! We used to have godhumai dosai while growing up. The batter was just wheat flour and it would taste good with sugar. This version with veggies looks colourful and will have a nice flavour to it. This is similar to besan chilla. I have not made it with whole wheat flour. Definitely should try this with vegetables. Looking very inviting Sowmya. I’ve made pancakes or chila using besan but not wheat flour. A good healthy recipe and easy to make. 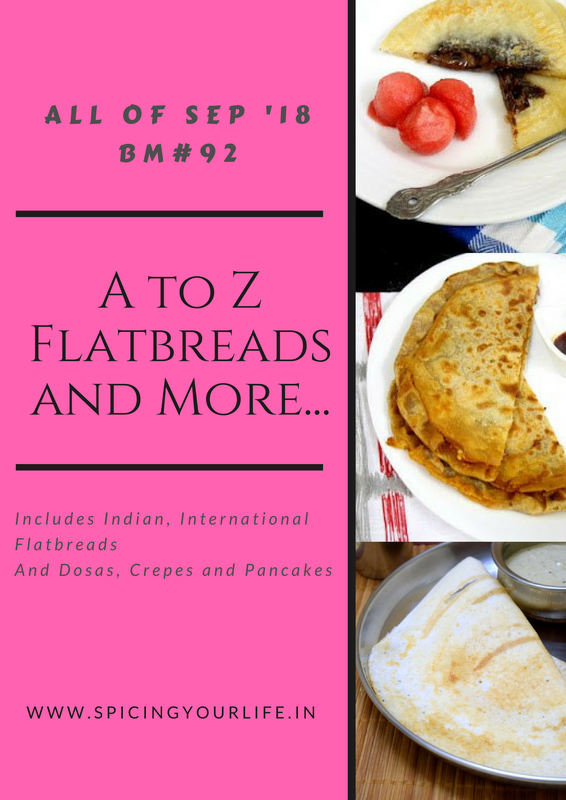 Just loving the different varieties of batter flatbreads you’re introducing me to. Delicious and healthy pancake. A great way to incorporate veggies in to your family’s diet. Sowmya, I like your new theme. That is a lovely quick dosai to make and a great recipe with vegetables in it. Thanks Sandhya for the feedback! This wheat dosa looks so good Sowmya, I remember wheat dosa being called as chap dosa by my bachelor friends many years ago..We basically make with just wheat flour and in my growing up years, I loved it with sugar mixed in water, just remembering that makes me want to make it again, its been so many years ago!..